I figured it out. All of it, everything. It all makes sense now. I like so many things. I like Summer because of its bounty. But I equally love Fall for its bounty. I can’t say I love one more than other, that would be false. But each season I find that I love things about it so much. 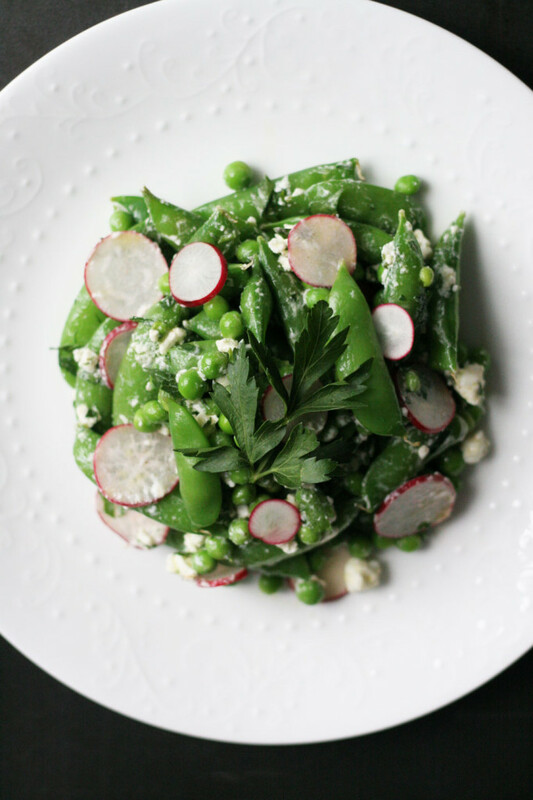 Snap peas and salads are one of those things. I like a good snap pea, I’ll eat a whole bowl. Raw. I like berries all Summer long. I’ll make cakes out of them. My conclusion, I like a lot of things, and they mostly involve food. That is why I started this whole business in the first place. Brian mentioned, all I talk about, morning to night, is food. So I like it, and I made you a salad of some of the Summer foods I like. It is a pretty, colorful, vitamin packed, lovely salad. Easy to make, ask the kids to pick to peas of the pods, they like helping. Enjoy! Note: In case you have never blanched vegetables…Blanching vegetables consists of placing a vegetable in hot water that has been brought to a boil, then reduced to a simmer. You place the vegetables in the water, using a slotted spoon, or spider. Allow them to cook until they turn a bright color, in this case a bright green. You typically blanch for 2-3 minutes. After blanching, you shock to vegetables in an ice bath to stop further cooking. 1. Bring a 4 quart pot of water to a boil over high heat, reduce to a simmer. While the water is coming to a boil, place a few cups of ice in a large bowl, cover with water, leaving a few inches at the top. 2. When the hot water is ready, place the snap peas, and shelled peas in the pot using a slotted spoon or spider for about 3 minutes, or until bright green. Remove by using a slotted spoon or spider, and place in the ice bath to stop cooking. Remove from the ice bath and place in a large bowl. 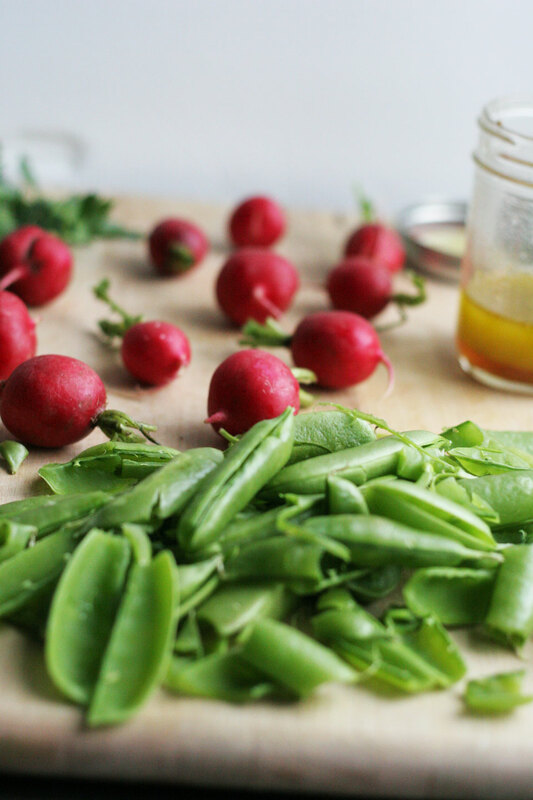 Add the radishes to the peas. 3. Add the oil, vinegar, salt, and pepper to a jar,shake to combine, or place in a bowl and whisk to combine. Pour over the vegetables, toss to combine. Add goat cheese, toss to combine. Taste for seasoning. Garnish with parsley. Serve immediately or store in an air tight container for up to 2 days. What a beautiful summer salad. Thank you sweets! It was tasty. 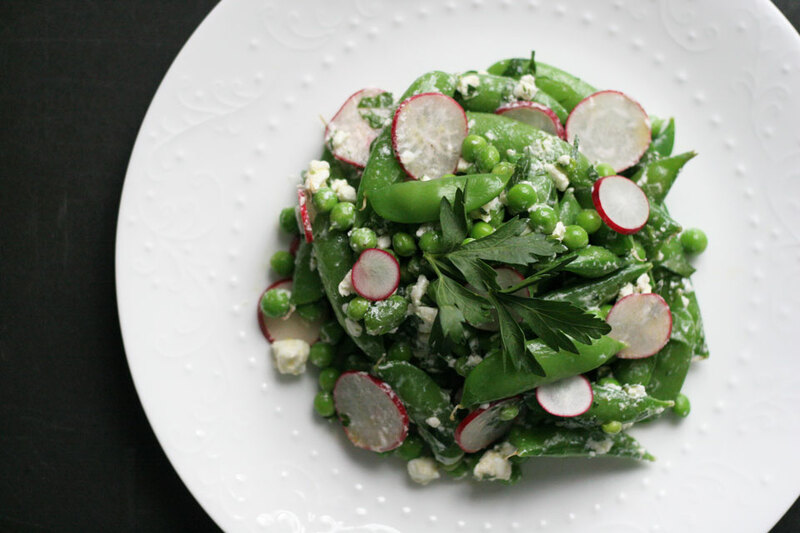 This has to be the springiest salad ever! 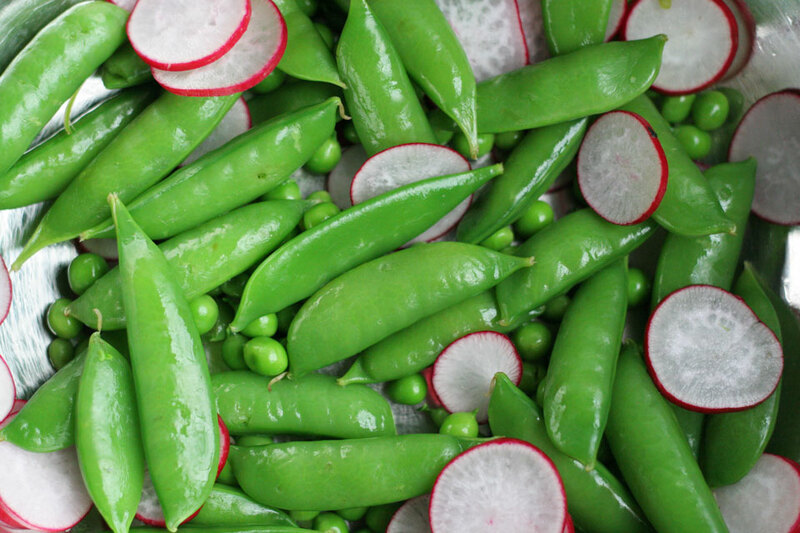 Love all the beautiful fresh peas and radishes–so good.